Please visit our showroom to see copies of these letters and many more. We are happy to write this letter of reference for your company and employees, as our recent kitchen renovation was made so much easier because of your employees. Jeff put together a lovely design, simple but making our small kitchen look much more elegant than we imagined. 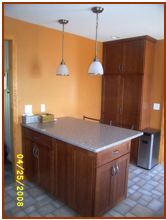 The colors are warm and the cabinetry a pleasure to view. Many friends have come to visit and have remarked at how gorgeous it looks, how professional the tile work is and Steve is still fascinated with the cupboard doors that close so quietly. I have also had a lot of comments on the faucet choice and nice deep sink. The job in general was done in a very timely manner. A few things came up, which is always the case and all was dealt with promptly and did not impede the job or overall schedule. I would be happy to recommend your company to others and would especially emphasize how polite and professional your employees are. I never once felt uncomfortable or worried about leaving the house in their care while I was gone. I feel we have new friends and would look forward to working with you all again. Thank you all so much for our wonderful new kitchen! We appreciate all you’ve done to create just the perfect kitchen for our family. Ray, your attention to detail along with all you helpful insights and suggestions helped to make it functional and attractive. From your first visit to our home back in January spending 2 ½ hours with us trying to decide what it was we actually wanted; to the phone call and emailswhen we wanted to make a change in the tile design the day before the tile was to be installed; and all the questions we asked that you were able to answer quickly and accurately throughout the process-THANK YOU! You made the entire remodeling process a pleasure. Greg and Tom did a fantastic job! Greg worked many days alone, but did the work of 2 men anyway! Tom and Greg both take pride in their work and it shows. They were both friendly and helpful in answering our questions as the work progressed. The kitchen was cleaned and swept every afternoon before they left for the day. 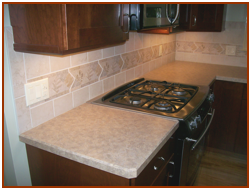 John and Mike did a great job laying the floor and tiling the backsplash. 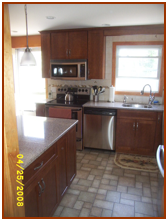 They also finished up many of the little things that needed to be done along with installing the dishwasher and range. We are extremely pleased with the result. We will be proudly showing off our new kitchen and will recommend Heritage Kitchens to everyone! Thank you Chuck for coming out to our home, and helping us decide about the many changes we were gong to do to the house. You made it easy for us to have all these things accomplished in a three month period! You were there to check on the progress, and provide excellent alternatives when something wasn’t available. Thank you to Brenda who helped us through the picking of flooring, cabinets, sinks, vanities, shower, mirrors, fixtures, toilets, and colors for all of them. Much appreciated help! 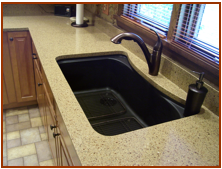 Also, thank you to Cindy who helped us on a couple of special items, especially the kitchen sink which we love! Thank you Tom for being such a great team manager! We trusted your judgment and call throughout the entire process. From demolition, removal of old furniture, to the finished product your workmanship and work ethics are to be admired, and we greatly appreciated them. We really felt a lot like family with you, Steve and John who were with us 5 days a week for 3 months! Thanks to John for his excellent flooring jobs in kitchen, family room, foyer and 2 bathrooms! Thanks to Steve for his plumbing expertise especially the laundry room fixture. Thanks to all of you for making this process an enjoyable experience. You were there for all questions. You were always courteous, polite and kept us smiling. You cleaned up after work each day which was very appreciated. Thanks to Ed and his son Steve for the painting of ceilings and doors, and all the wall papering throughout the house. They did a great job! Thanks to Tripp and his special 3 men team who put in all the carpeting throughout the house. They did an excellent job! 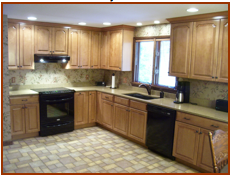 There is no doubt in our minds that if we need any other work done to our house, we would use Heritage Kitchen & Bath again. Here is a check for the balance of the work on my condo. Thank you all so much for such a professional, first rate job! I never thought I would say that I actually enjoyed such a project and it was fun! – mainly because everyone I dealt with genuinely cared and went above and beyond to make everything work out! This note is long overdue, but I wanted to let you know how pleased we are with the new master bathroom. Your help in space planning and material selection really made a difference. The installers did a great job and could not have been easier to work with. Projects of this size and scope usually have a hitch or two, and we were no exception. I am very pleased how you handled the one small issue we encountered, and could have lived with, but you insisted on us being totally happy and took the steps to make that happen. I think these are the things prospective customers should know about - - the way you and Heritage do business. Kitchens and baths are expensive propositions and homeowners want to feel they get their money’s worth. We did. It was a pleasure to work with you. We could not be more pleased with our new master bath! We will call you when we get ready for the next project. Thank you so much for the gift certificate to our favorite restaurant. Totally unnecessary but greatly appreciated. Even more thanks go out to all of you for the incredible job with the makeover of our home. What an amazing difference. Every person at HK&B that we worked with (and it was possibly everyone) was professional, trustworthy, personable, skilled, and knowledgeable. All these qualities prevented the experience from being a stressful one. We are constantly recommending you and will continue to do so. Thanks again for EVERYTHING!!! 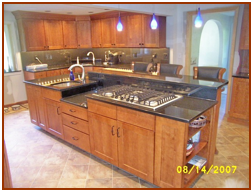 Our kitchen was the second project that we completed with Chuck and Heritage Kitchen & Bath. 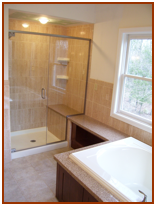 We are extremely pleased with the end result of both projects (the first was the bathroom). The quality of the work and materials was outstanding. Everyday Jeff cleaned up when he was done. Every project has some “speed bumps”, ours was no exception; but they were handled honestly, fairly and to our satisfaction. We are most pleased with the design and finished project. They did what they said they would, when they said, and how they said they would. We would engage Heritage again when we have additional projects. Enclosed is our check for the balance on the renovation of our bathroom. The result of this renovation is simply wonderful! Our antiquated facility has been turned into an attractive bathroom. A great deal of the thanks for this renovation goes to your competent staff. Jeff and John quickly completed the removal of the old fixtures and the renovation work. John did a nice job on the installation of the new floor; the new plumbing; and fixtures. Paul and Earle added the finishing touch with the wallpaper and painting. Everyone was committed to quality workmanship, and, equally important, they were always considerate of our presence in the house while they worked. Please express our thanks to everyone involved with this job.